The day was jam packed with panel discussions and mini sessions led by some of Chicago's top bloggers. They tackled just about every blogging topic you could think of! From the very basics of finding your niche, to how to pitch to and work with brands and everything in between. Not only were the speakers some of the best in the business, but they all extremely humble, knowledgable and more than willing to share that knowledge to help us grow. I want to give a HUGE thank you to Windy City Blogger Collective for being girl bosses and flawlessly putting together this experience for us! Also, to all of the wonderful speakers... Thank you for sharing your knowledge and insight and being willing to help us all succeed! Besides the epic speakers, all of the blogger babes I met at #BlogYourBest2016 are amazing! The room was filled with beautiful, talented, driven, fashionable women (and a few men)! It's a wonderful thing to be in a room full of people itching to learn and to pick each other up and help each other succeed. I'm so excited to now be a part of this amazing network of Midwest bloggers! I decided to go with comfort and simplicity for the full day conference. I wore my favorite, cozy, turtleneck sweater paired with my only (and very old) pair of boyfriend jeans. My new favorite way to style the jeans is with one large cuff to have them be the right crop depending on the choice of shoe! 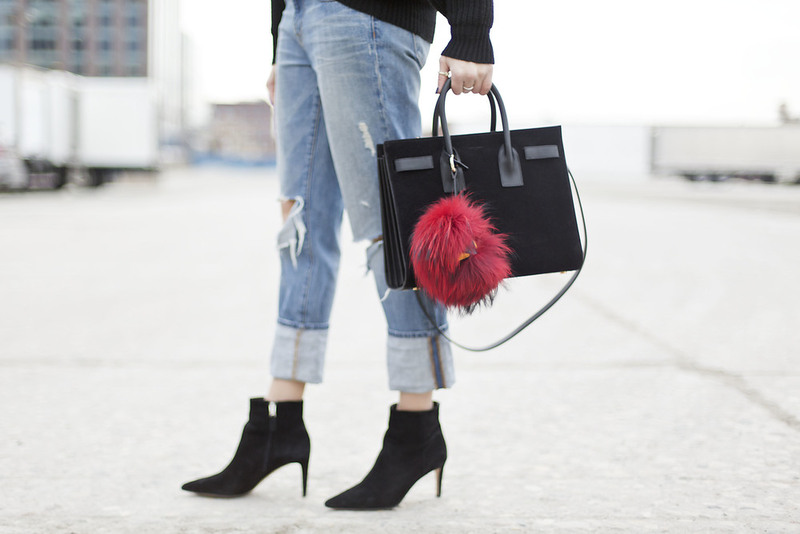 For accessories I went with a wool hat, a simple bootie and a structured bag adorned with my fuzzy monster, Frederick. A simple combo to guarantee comfort while still looking put together! Keep scrolling! Tons of similar items linked below ! This Valentines day, love yourself!